(sorry guys I just cant bring myself to deleting him :D)I am an eclectic individual. I have been exposed to many different cultures and backgrounds over the years and this reflects in my work. I will take what I think is good or what appeals to me from a given culture and their way of making blades and fittings and using my own creativity I will put those techniques together in the creation of what some people will refer to as a "hybrid" design. Jesus will be doing some smelting and other traditional japanese techniques. Matt Stagmer has been making swords for over 16 years. He got his start as a maker making custom axes before he even had his drivers licence. Many different artists have inspired Matt over the many years of hanging out and working at the BKS shop. Matt will be demoing some forge work and will be doing several sword grinding demos. Sam is a talented blacksmith. He has been a great addition working full time now for BKS. His knowledge of blacksmithing and bladesmithing far exceeds his age. Sam will be demoing several different forging techniques and giving a talk about heat treating. Rob "Deker" Dekelbaum was introduced to bladesmithing in 2005 when he took a weekend class in knife making held by the Blacksmith Guild of Central Maryland. Since then it's been a downward spiral into the flames of the forge. He's been lucky enough to have befriended some excellent smiths who have taught him a lot in a very short time. Deker makes all of his own pattern welded steel and has recently begun working on mosaic patterning. 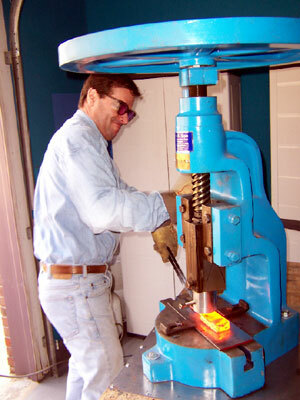 Mark Green will be doing some charcoal smelting and some water casting of ingot. Ilya is a highly motivated craftsman. His artistry seems to have no bounds. From painting and sketching to repoussé and chasing. Ilya currently works with BKS making armor and other high end weaponry. He will be demoing engraving and other similar techniques. Zeb will be running some of the charcoal smelting and possibly forging of the blooms. Larry has been a a staple in the knife community since the 70's. After years of martial arts study with an emphasis on self defense the use of knifes he started making knives that best fit practical use in combat and in the work place. 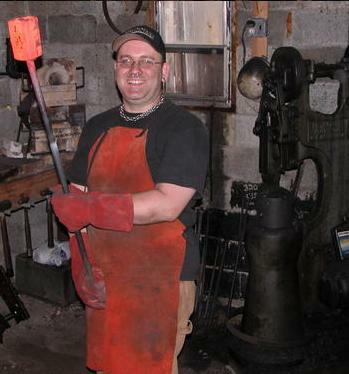 He will also be forging some pattern damascus throughout the weekend and other general forging projects. Jim will be showing us the art of bow making. He has a vast knowledge of archery and will be sharing a ton of info. Perhaps, he will break out a whip or two as well. Help support the contributors of our event by visiting their web sites.